Although fibroid embolization in Southern Africa is relatively new, the origin of uterine artery embolization was first performed back in 1979. Today it is a state of the art procedure that can control severe hemorrhage after childbirth. Women of African descent are much more likely to suffer from uterine fibroids and on average tend to develop this potentially debilitating medical condition, a major women’s health issue in southern Africa, at an earlier age than women of other population groups. Although all women are potentially at risk of developing uterine fibroids, there is much anecdotal evidence from around the world to suggest that women of African descent are at greater risk than Caucasian women of developing this condition and to suffer serious symptoms. This is supported by our own experience. The content of this video is attributed to the work done by Dr W. Walker, a leader in the field, from the Royal Surrey Hospital, England. 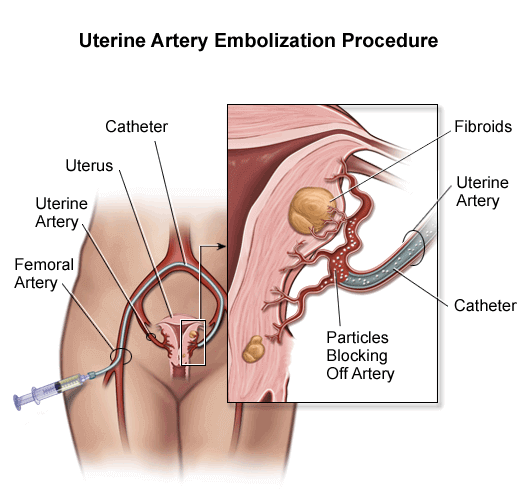 The fibroid treatment known as the Uterine artery embolization is carried out as an endovascular procedure by a radiologist in an interventional suite. Patients who undergo the procedure do not need to undergo general anesthetic, and are rather provided with light sedation so that, although they are sleepy at the time of the procedure, they remain awake and breathing on their own. Access to the arteries supplying the fibroids in the uterus is acquired by means of wires and catheters (small flexible tubes) which are inserted through a small hole in the artery of the groin (femoral artery) or artery in the wrist (radial). The position of the correct artery supplying the fibroids is located by injecting an iodine based solution which maps out the arteries. These images are then used as a map for the radiologist to gain access to the uterine arteries. Once the catheters are in place, the treatment can begin. The artificial embolic agents used are Contour PVA Embolization Particles, developed by Boston Scientific. These particles are designed to occlude all the tiny vessels supplying the fibroids. Following Uterine fibroid embolisation, the patient is observed for 6 hours under direct nursing supervision and placed on a patient-controlled analgesic pump. This allows the patient to manage their own pain control. The majority of patients are discharged the day after the procedure. A six-week follow-up visit is usually scheduled with the referring doctor. Ideal candidates include women with symptomatic fibroids (otherwise known as myomas or leiomyomas) who express the desire for uterine preservation and/or looking for an alternative to surgery. Pre-procedure evaluation for uterine artery embolisation should include a comprehensive history and physical examination, a recent gynecologic examination performed by an gynaecologist, a recent Pap smear, an endometrial biopsy for patients with dysfunctional uterine bleeding and imaging documenting the presence of uterine fibroids ( usually an ultrasound scan). Exclusion criteria included pregnancy; patients with severe renal insufficiency not receiving dialysis; history of pelvic irradiation; ovarian, endometrial, uterine or cervical carcinoma; pelvic inflammatory disease or other pelvic infection and endometritis. Relative contraindications include severe allergy to iodinated contrast and uncorrectable bleeding diathesis.